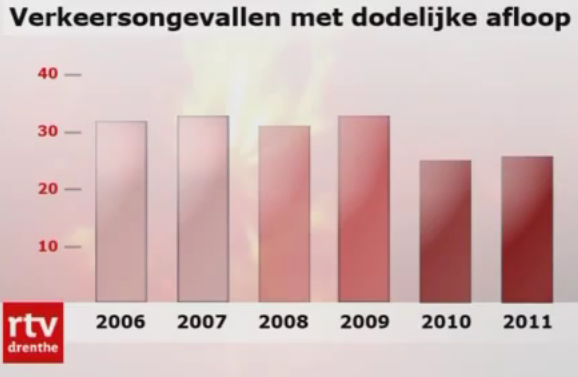 A few days back, the local TV news covered the rate of road deaths in our province. They gave figures for the total of all traffic deaths, including drivers, cyclists and pedestrians. In 2003, there were 46 transport related deaths in the province, but this has been dropping. 26 died in 2011. In Assen, the capital of Drenthe, and three other council areas within the province, there were no traffic deaths last year. The highest figure was in Midden Drenthe, which has a relatively large number of busy roads. The local government spokesman in the video explains that the reason for the reduction in deaths is that the roads have been re-engineered to reduce conflicts and remove danger, though of course he also says that behaviour of drivers is important. Improving the infrastructure to make the roads more self-explanatory and to reduce conflict is an established way to improve safety. These are the principles of Sustainable Safety in action. Sustainable safety not only improves conditions for cycling, but benefits all road users. This universality makes sustainable safety a good thing to campaign for in other countries as well. Drenthe is the least densely populated province of the Netherlands. Just under half a million people spread across 2600 square kms - 190 people per square km. This density is lower than five US states and less than half that of England. After last week's blog post including a video from local TV which illustrated the efforts taken to ensure that the cycle-paths of Drenthe are well maintained, here's another view. There are protests about the plans to renew a particular junction, which is now showing its age. The introduction to the video says "Drenthe is a real cycling province. Cycle-paths go everywhere, and when the weather's fine it's extremely pleasant to ride around the countryside. However, according to work-group Kop van Drenthe, there is still more to be done to make cycle-paths better". One of the reasons why the infrastructure continues to improve in the Netherlands is that people continue to complain about what they have and continue to strive to make it better. There is no complacency and no celebration of having "finished" anything. To stop making improvements would mean starting to slide backwards. Therefore, progress is continual. In another example of a protest, last year, I wrote about complaints in Groningen which helped to prevent that city from winning the "cycle city of the year" competition. On the back of an announcement of more money for child cycle training, the Department for Transport in the UK has released a report titled "Cycling to School - A review of school census and Bikeability report data". Sadly, this confirms what I wrote last November about how an emphasis on Bikeability and Cycling Proficiency have failed British cycling. The new figures shows again how the rates of children cycling to school remain extraordinarily low in the UK. The change over the period of 2006 to 2011 is given as -0.01% for 5-10 year olds and +0.06% for 11-15 year olds. This is also presented as a change of 0% for all ages combined. I have no doubt at all that those who train child cyclists in the UK do so with the best possible motives. However, effort shouldn't be confused with success. Sadly, the effort of the people doing the training is being squandered on something which looks good in press releases ("More money for school cycle training" !) but doesn't actually make any real difference. While British children are being trained in large numbers, this does not lead to them cycling. Conditions on the streets of the UK simply remain too unpleasant and too dangerous for more than a very small proportion of parents to allow their children to cycle. There are also new figures for the whole population's cycling activity. These show that the average of 16 bicycle trips per person per year in 2006 has changed to an average of 15 bicycle trips per person per year in 2010. Both these sets of figures come from a time when many people in the UK have spoken of growth in cycling. While growth is often reported in the UK, those reports are often not based in fact. There's a long history of unsubstantiated claims. This is not real progress. Real growth can be measured and would appear in these figures. All that we've been able to see for many years in the UK is a change in the least significant digit of a small number, and these new figures again show a continuation of the same statistical noise as I wrote about in 2010. For comparison, the Dutch population makes on average about 0.8 trips by bike per day, which is equivalent to about 220 trips per person per year. The UK's figures are far lower and as you can plainly see, it's not only children who rarely cycle in the UK, but adults also find the conditions for cycling unpleasant. In the UK, "cyclists" continue to cycle, while the majority of the population continues to think it is too dangerous to cycle. When even many campaigners in Britain continue not to ask for enough and don't aim at the right people to make a real difference, it's hardly surprising that the government doesn't do so either. To know what is really going on, campaigners need to become less easily satisfied and more critical of claims that cycling is growing. If you look at the figures for cycling over time, it is very easy to see that the UK has not developed a set of policies which have led to a real increase. It is important to recognize this truth, not to imagine that a non-existant cycling revolution is taking place, not to believe deliberately confusing hype and not to look in the wrong direction for solutions. Rather, it is important to acknowledge the facts for what they are. Yes, it's unfortunate that cycling has stagnated at a very low level. However, by acknowledging this fact, there is a base to work from. What's more, by accepting properly gathered statistics, there is a yard-stick against which any future progress can be measured. hug the kerb putting them in danger. That's why I never trained children. For cycling to grow, real change is needed. An emphasis on "soft measures" such as training has failed in the past and will continue to fail in the future. Cycle training and marketing of cycling are but a small part of what is required. These measures do not work in isolation from changing the streets for the simple reason that they do not solve the problems that people face when they try to cycle. There will be no real increase in cycling in Britain until real funding is provided, excuses stop being made, and the country starts to copy the best parts of the best examples without misunderstanding the intent. This is the only way in which the conditions which can result in real mass cycling can be created. My attention has been drawn to a very interesting graphic from Joe Dunckley showing the impact of cycle training on the frequency of cycling in the UK. 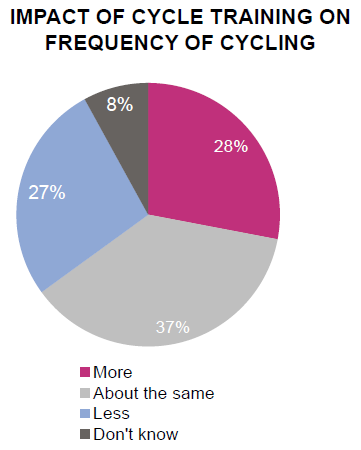 The data came from Transport for London's Attitudes to cycling report and shows that after they've had cycle training people are as likely to cycle less as they are to cycle more. More on exaggeration and broken promises. And as for cycling to school, even pre-schoolers can be seen riding their own bikes to day-care in the Netherlands. From an average age of 8.6, very nearly every Dutch child rides independently. See also the Cyclists in the City blog for another view of the same figures, while Joe Dunckley provides a humourous take by pointing out that "press releases announcing the annual funding for cycling training that they've been funding for decades now outnumber actual cyclists". Again and again I read comments of the form "even in Holland not all parts of rides are segregated" or talk of "similar road exposure" in the UK vs. the Netherlands. I've been accused of making out that the cycle-path network in the Netherlands is more extensive than it actually is. Such comments are based on a misunderstanding of the differences between the way that roads and streets are designed and used in the two countries. for bikes but access only for cars. The misunderstanding usually arises because someone notices the simple statistic which says that while the Netherlands has about 130000 km of roads, there are only about 35000 km of cycle-path. This sounds, of course, like there is a serious short-fall of segregated cycle paths. The first misconception is that people look at these figures as if those 130000 km of roads are exactly the same as roads in their own country and assume that cyclists find themselves in conditions which are like in their own country. That's not correct. The second misconception is to assume that because there are a quarter as many km of cycle-paths as roads that Dutch cyclists spend 3/4 of their time riding on roads. That's also not correct. Quite simply, these are the wrong ways to look at those figures. Dutch people do cycle on a mixture of cycle-paths and roads. However, this does not mean that cyclists in the Netherlands spend much of their time mixing with motor vehicles. Over the last few decades, the Netherlands has unravelled the networks of car and bicycle routes. If you compare routes for the same journey by bicycle and by car, then in very many cases you will find that the two routes are very different to one another. A child rides a bike in the middle of a bicycle street. only by car / through route by bike. I've demonstrated this principle several times on this blog (1 2 3 4 5 6 7 8). In some cases the separation of routes is achieved by building of cycle-paths. However, in many others it is achieved by removing cars from the roads. Sometimes when new roads are built, the old road can serve cyclists very well. These days, very many roads and streets are simply no longer part of the route network for cars. They still allow access by car, so that deliveries can be made and people who live along them may reach their own homes by car should they wish, but they are not through routes by car. As a result, such streets are absolutely not dominated by cars. A cyclist using a road on such a route has much the same feelings about safety as someone using a cycle-path. It is only when cycling doesn't feel like an extreme sport that it can become so popular as it is in the Netherlands. Residential streets in the Netherlands rarely work as through roads for cars, even if they were originally designed to do so. This makes them excellent places to cycle or walk with a high degree of comfort and safety. In some cases, this has been formalized by creation of woonerven, but many of the same characteristics can be found in residential streets which are not woonerven. Woonerven have a speed limit of "walking pace". However, they are not the only roads with low speed limits. In fact, over 40000 km of roads in the Netherlands, a third of the total, have a speed limit of 30 km/h or lower. This lowering of speeds on minor roads has been done to the maximum possible extent. It is now difficult to achieve more safety by this method as roads which remain through routes for motor vehicles are not effectively calmed simply by changing the speed limit. The photos give examples of different roads and streets on which cyclists have the same feeling of subjective safety, and similar degree of actual safety, as on a cycle-path. These principles are not used only in towns. They are also common in villages and in the countryside. Minor streets in villages don't work as through roads so drivers don't use those to "rat run" either. This makes it possible for quite young children to cycle to school and back unaccompanied. Between towns in the Netherlands you can often find two roads next to each other. One for cars, the other for cyclists, agricultural vehicles and access to homes. Sometimes the route for drivers isn't visible from the route for cyclists. Even in the open countryside you can ride long distances by bike on "roads" and rarely see any cars at all. Such roads only make a through network by bicycle because they are joined by cycle-paths. For drivers, many roads in the countryside offer nothing more than long detours, dead-ends, and roads with rough surfaces which don't get cleared in the winter. Unravelling, or separating, the routes taken by motorists and cyclists has many advantages, including a reduction of noise and exhaust fumes as well as the increase in safety which comes due to a reduction in the number of chances for conflict. Cyclists achieve subjective safety when they do not have to mix with cars, not specifically because they are on a cycle-path. Roads which have (almost) no cars on them do not require a cycle-path to parallel that road. A remarkably large proportion of roads in the Netherlands are, for all practical purposes, free of cars. This is just one reason 35000 km of cycle-path does not represent a short-fall compared with 130000 km of road. Those roads on which there is an appreciable volume of traffic can be relied upon always to have segregated cycle-paths alongside. By this manner, very nearly full segregation of modes is possible when cycle-paths have a total length which is "only" about a quarter of the total length of the roads. While cyclists are segregated from traffic in every photo in this blog post, this is the only photo in which this was achieved by building a cycle-path. This is a through road for cars and is used by a higher number of motor vehicles, so it needs a cycle-path. The title of this post is deliberately provocative. However, it's not inaccurate. This has been my experience: When cycling in the Netherlands, you are almost always segregated from traffic, whether by means of a cycle-path, or otherwise. I have ridden many tens of thousands of kilometres in the Netherlands but not yet found anywhere that felt so dangerous for cycling as did my daily commute in Cambridge. My total experience of "road rage" in this country remains just one minor incident in nearly five years. This map, which accompanied the printed version of this article from the Fietsberaad about Enschede, shows how main routes for cycling have in large part been unravelled from main routes for motor vehicles in that city. In the article it is explained that the absolute maximum number of motor vehicles per day on these routes should 2500 - i.e. a number that you might find on a residential street. More than this and the route starts to feel unpleasant and threatening for cyclists. This unravelling of the cycle network from the motor vehicle network is taking place all across the Netherlands. Where there are higher levels of motor vehicle usage, even within residential areas, the public shows a preference for separated cycle-paths. Many cyclists who visit the Netherlands on holiday remain oblivious to concepts like this. It is common that people who visit on holiday report that they had few problems cycling in the Netherlands despite there being cycle-paths for only part of their journey. Often this is ascribed to better driver behaviour, perhaps through better training. However, people who make such statements have simply not noticed this "hidden" policy. Roads here are not the same as roads in other countries. Segregation of modes takes place even where there are no cycle-paths. Sustainable safety principles require that conflict is reduced and that is what results in the much better subjective safety when cycling. Our unique experience of having lived, cycled and campaigned in both the UK and the Netherlands has led to the programme of our three day study tours in which we transfer as much as possible of this knowledge. The tours are hands-on. Or, rather, they really are tours. You use the facilities for yourself, accompanied so that we can explain about what you are experiencing. To find out more, please book a tour. This post originally referred to 29000 km of cycle-path in the Netherlands. However, this was an older figure. There are now reckoned to be about 35000 km of cycle-paths. This blog post introduced the term "unravelling" into the English language as a translation of the Dutch term "ontvlecthten". There was no previous English translation of this term. Others have picked up my translation while an academic paper in 2013 used the term "unbundling" instead to represent the same concept.